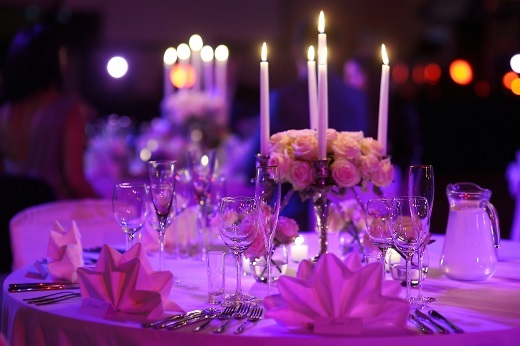 It’s not uncommon for couples to begin searching for the perfect wedding reception venue shortly after they become engaged. It is important to not only find a venue that meets your specific needs but also find it early enough to ensure it can be booked for your date. If are looking for the right wedding reception venue, remember these 3 tips throughout your search to make an educated decision. The number of guests you plan on having at your wedding will ultimately determine the size of the venue that you choose. It is important to not only have room for dining but also have the appropriate amount of space for dancing and entertainment as well as other essentials such as the bar or DJ booth. Make sure you know the size requirements needed to avoid booking a venue that is too small and, instead, finding the right wedding reception venue. Finding a venue that fits the tone and atmosphere you hope to achieve can substantially cut down on the costs required to transform a location with decorations. With the wide variety of venues in the Tulsa area that can be used for your wedding, they likely have different atmospheres and décor. Find the one that works best for you and feels right. If possible, try to find a venue that provides audio equipment to cut down on the entertainment costs needed for your wedding reception. As a large event center in Tulsa, Stokely Event Center provides a plug and play sound system with an included microphone with each booking. We also have a great space for your guests to celebrate your special day and dance the night away. Why Choose Stokely Event Center for Your Wedding? If you are currently looking for wedding venues in Tulsa for your event, Stokely Event Center can make sure your special day is unforgettable. Guests will love the free-to-play games and a wide assortment of decorative signs. With the flexibility of catering in outside food and drinks, event menus can fit a variety of preferences. Our sound system, projector and screen are included for one great price to meet your audio/visual needs. If you are interested in reserving Stokely Event Center, please call us at 918-600-4448 or complete our online request form. We can’t wait to be part of your special event!